One of the most important social issues of the last five years is fatal police shootings of black Americans. The concern that police fatally shoot blacks at higher rates than whites has given rise to a strong push for department-wide interventions for police officers. Such interventions, usually in the form of "implicit bias" training, rely on changing the beliefs that officers have about minorities as a means of reducing this racial disparity. But are the assumptions underlying these interventions reasonable? Is there strong evidence that faulty officer decision-making is responsible for the racial disparity in fatal police shootings? There is clear evidence of racial differences in fatal police shootings in terms of population proportions. Black Americans are only about 13 percent of the population, but make up over 30 percent of people fatally shot by police. It is from this evidence that many news outlets and activists conclude that police officers are racially-biased in their decisions to shoot. If this is true, then it makes good sense to target officer bias. But is comparing the percentages of blacks and whites shot to the percentages of blacks and whites in the population really the right comparison? Does it tell us what we need to know about how to reduce fatal police shootings? My colleagues and I have expertise in decision-making and police use of force. We tested whether these population-level comparisons provide us with the information we need to reduce police shootings. Our recent work, published in Social Psychological and Personality Science, reveals a different view of police bias. Using population-level comparisons as a benchmark for evidence of officer racial bias relies on the assumption that people of all races are equally involved in situations where officers are likely to use deadly force. We argue that this assumption has led to a misdiagnosis of the problem, and by extension, solutions that won't work. Consider the following example: Imagine that you want to know if there is racial disparity in who receives cancer treatment. You find that among those receiving treatment, blacks make up 13 percent. Comparing this to the overall population of 13 percent, you would conclude that no racial disparity existed. Yet suppose you learn that blacks make up 75 percent of people with cancer. Surely you would conclude that there is racial disparity in receiving treatment. That's because the relevant pool is those who need treatment, not the general population. More likely to be shot, compared to what? As with the cancer example above, it is crucial to choose the correct benchmark or pool of individuals to compare an outcome with. In the case of police shootings, the evidence is clear that fatal shootings are strongly tied to situations in which violent crime is being committed or suspected of being committed. A typical fatal police shooting occurs when there is the potential for imminent death to an officer or other citizen. Almost 85 percent of police fatal shootings involve armed citizens. What about shootings of unarmed citizens? The results were too uncertain to draw firm conclusions one way or another. This is because the number of fatal shootings in which a citizen is unarmed and not assaulting an officer is small – about 6 percent of all fatal shootings, or 45 people every year. To be clear, there is a population-level racial disparity in fatal police shootings. 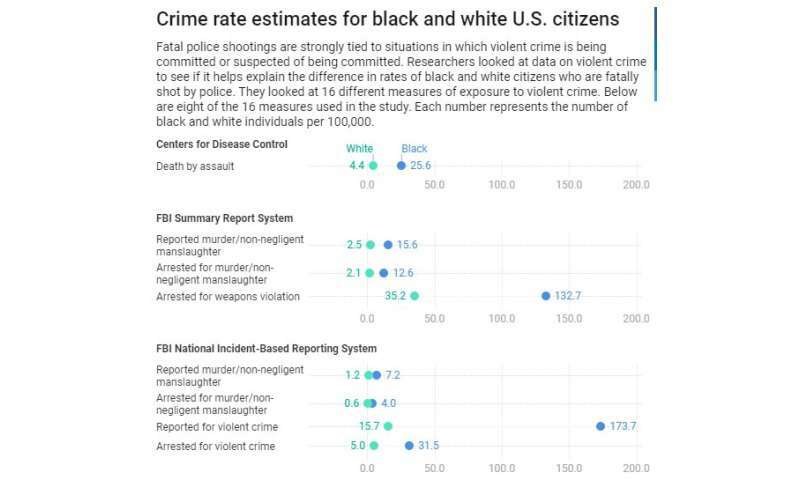 But our work suggests this disparity is explained by differences in rates of exposure to the police, rather than racial bias by officers making deadly force decisions. These results may help explain why department-wide implicit bias training has not been – and will not be – effective. It is not addressing the root of the problem. The notion that all officers across the profession are biased in this important decision is not supported by the data. Instead, our research suggests two paths for reducing fatal police shootings and reducing the population-level gap in these shootings. First, the most effective means of reducing police shootings would be to reduce violent crime, particularly crimes involving firearms. While this may seem obvious, the point has been lost in most public discussions. The decision to shoot usually happens in certain contexts – reducing the frequency of those events will directly reduce police shootings. At the same time, it would also reduce police shootings of innocent unarmed citizens who live in neighborhoods with high rates of violent crime. One recent example is the case of Akai Gurley, an unarmed black man who was killed by police patrolling a public housing building in New York City with high rates of violent crime. Reducing violent crime rates would reduce the expectation that officers have of encountering armed individuals in such locations, likely reducing such mistakes. Second, researchers need to develop tools that accurately identify those few officers who do show robust evidence of racial bias and identify which psychological processes are responsible for such bias. Officers might treat black and white citizens differently due to implicit bias, explicit racism, or even something much more basic such as low skill at visually distinguishing harmless objects from guns. Targeted interventions, based on a scientific understanding of bias, are needed – not blanket, untested interventions based on faulty assumptions. Our lab has recently been awarded a National Science Foundation grant to develop such interventions. All research has limitations, and ours is no exception. Our analyses look at national data and cannot speak to any individual case or police officer. Moreover, there is robust evidence of racial bias in other use-of-force behaviors, such as Taser use – just not the use of deadly force. Anti-bias training might be effective in stemming these racially-biased policing behaviors. Finally, the question of why crime rates are different across racial groups in the U.S. is a complicated question beyond the scope of this research, and thus we do not speak to this issue. Nonetheless, we believe that any research that can suggest new and innovative interventions to address this important problem should be encouraged.